Sts Peter and Paul Church of Rockaway, NJ (Chapter 43) is pleased to be the host for the 2017 69th Metropolitan Orestes Memorial Bowling Tournament. Come join them for an enjoyable weekend of bowling, Christian Fellowship and worship in Rockaway, NJ. All are welcome and need not be ACRY members to participate! Sign up today! All pertinent information is provided below! Rockaway Townsquare Mall parking lot means there are many stores, restaurants, and even a movie theater in close proximity. Room rates have been set at $119 per night plus tax for rooms with 1 King Bed or 2 Queen Beds. A limited number of King Suites are available at $159 per night plus tax. The hotel expects to be hosting weddings this weekend, so please make your reservations sooner than later. After May 5, the room block will be released. The room rate is available for Thursday, May 25th for anyone that would like to arrive early. Friday Night Family Night at SS. Peter & Paul Church 66 Beach Street Rockaway, NJ 07866. After checking in at the hotel, registration will be at Sts. Peter and Paul Church where an evening of Food, fellowship, and prayer awaits. Saturday Dinner - A Backyard BBQ including a pig roast & fried chicken will be held at Sts Peter and Paul Church Hall. Sunday Breakfast - Sunday Breakfast Buffet - Following Divine Liturgy at Sts. Peter and Paul Church Hall. Grand Banquet Sunday Evening - The Grand Banquet & Awards Dinner will be held at the Hilton Garden Inn. Meal Choices are: Chicken Francese, Beef Bordelaise, and Vegetarian. Download Explanatory Letter For further information on individual ticket prices, meal descriptions and registration information. We are asking that you fill out the PDF electronically and email it to sheffieldfitz@optonline.net . If you follow the directions in the letter by putting 1 in the correct columns, the form will calculate all totals. 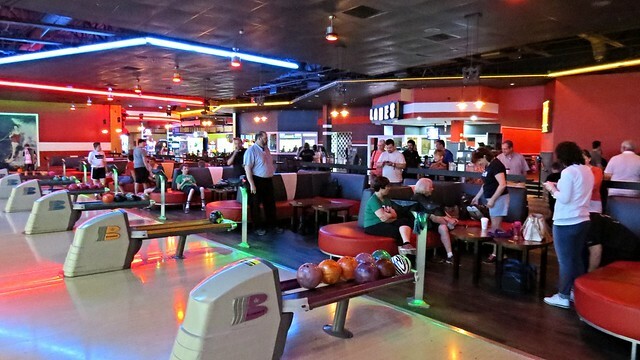 All Bowling events will be held at the Rockaway Lanes located nearby at 365 US Highway 46, Rockaway, NJ 07866. Each event will cost $14.00 which includes shoe rental. Seniors are individuals 18 years of age or older. Juniors are between the ages of 8 and 18. Bumper bowling is free and open to anyone under the age of 8. Each senior and junior event is $14.00 per bowler and includes 3 games and shoe rental. If anyone would like to bowl but are unable to form a team or doubles combo, the host chapter will help pair participants. Senior: Men and Women Teams, Men and Women Singles, Men and Women Doubles, Mixed Doubles. Junior: Boys and Girls Singles, Boys and Girls Doubles, Mixed Doubles. ACRY averages (160 for men and 140 for women) will be used for those without an established average. Note: Anyone is welcome to bowl, need not be ACRY members. However, bowlers must purchase all meals on the day they bowl. Trophies will be awarded on the night of each event at the dinner. Also to note, we have sanctioned this tournament so that if a sanctioned bowler has that awesome game or series, it can be reported to the bowling congress. Download Bowling Forms (PDF Format) which includes pricing information. Junior ACRY members and those attending the tournament ages 8-18 must return a signed parental consent form to the National Jr. ACRY Advisor, Angela Sudik, prior to arriving in order to attend, bowl or participate in any weekend activity. Everyone is encouraged to participate in the Bowling Tournament Commemorative Booklet, whether or not you can attend. The booklet provides an opportunity to extend good wishes to those in attendance and promote upcoming events. It will be printed and distributed to bowlers and guests when they arrive. Ad prices are Full-page $100.00, Half Page $65.00, Quarter Page $40.00, Patrons for $6.00, Boosters for $3.00 and Memorial listings for $6.00. Please consider doing so to show your support for this important Diocesan institution. Sunday Hierarchical Divine Liturgy will be held at Sts. Peter and Paul Church in Rockaway, NJ, followed by a Sunday breakfast buffet in the church hall. We will have floral arrangements at the church for Sunday’s Divine Liturgy as well as at the Sunday Evening Banquet. If you would like to make a donation towards the cost of the floral donations in memory of or for the health of someone, please contact us. You must be there 15 minutes befor your start time. You can view more information about each room and the location here. If you are interested, please fill out the attached form (one per chapter) with your information and send to Barbara Fitzgerald (information below) by May 15th. Please note that these rooms are reserved for ACRY members, so even if you sign up as a single, you will be placed with a group of other ACRY members, or you may sign up as a group. After May 15th, any unused rooms will be released back to the public. More information will be out with meal plans, golf, etc. shortly. Updates will be sent out to chapters via e-mail, and will be posted here, the National ACRY Facebook page and SS. Peter & Paul’s Church website.